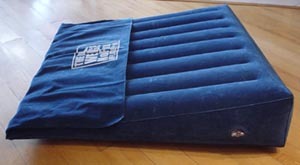 A portable sleep wedge perfect for home or travel. The Wedge NoFlux Inflatable Pad provides the #1 Doctor-recommended non-prescription way to help relieve the unpleasant symptoms of night-time digestion. 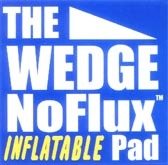 The Wedge NoFlux Inflatable Pad is convenient and easy to use. It's ideal for use at home and portable for traveling. The WEDGE measures only 10" x 10"x 1-1/2", about the size of a folded dress shirt, when deflated. (tapers to 1/4" at bottom) when inflated. The WEDGE weighs only 28 ounces and fits in its own traveling carry case. 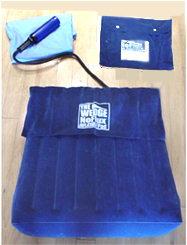 The WEDGE comes with a hand pump for inflation within three minutes. A 100% cotton slip case, removable for easy laundering, is included.